With fifteen shilpis working, progress is fast on the shrines. Work will begin soon on the vimanam, the gopuram on the roof over the Sri Venkateswara shrine. 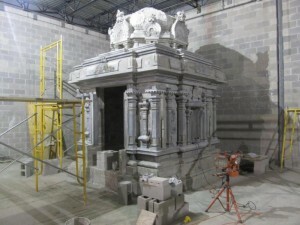 The first stones from the Venkateswara shrine, carved from solid granite, should arrive in mid-January. The stoneworkers will arrive on January 21st. Copyright © 2013 Sri Venkateswara Temple of Austin. All Rights Reserved.